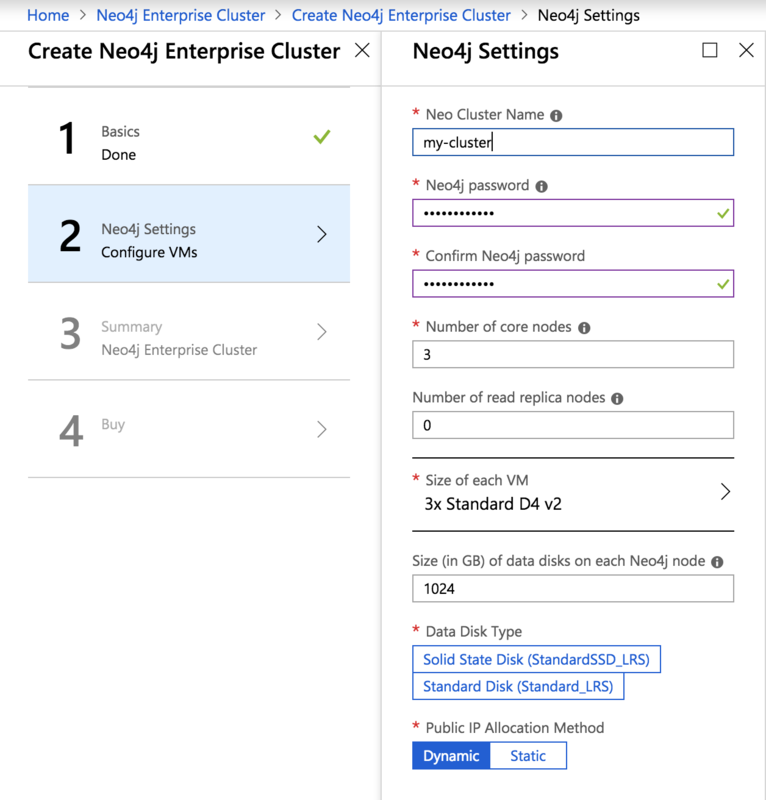 You have a Neo4j Enterprise license, or a trial license for Azure. You should have familiarity with causal cluster architecture. 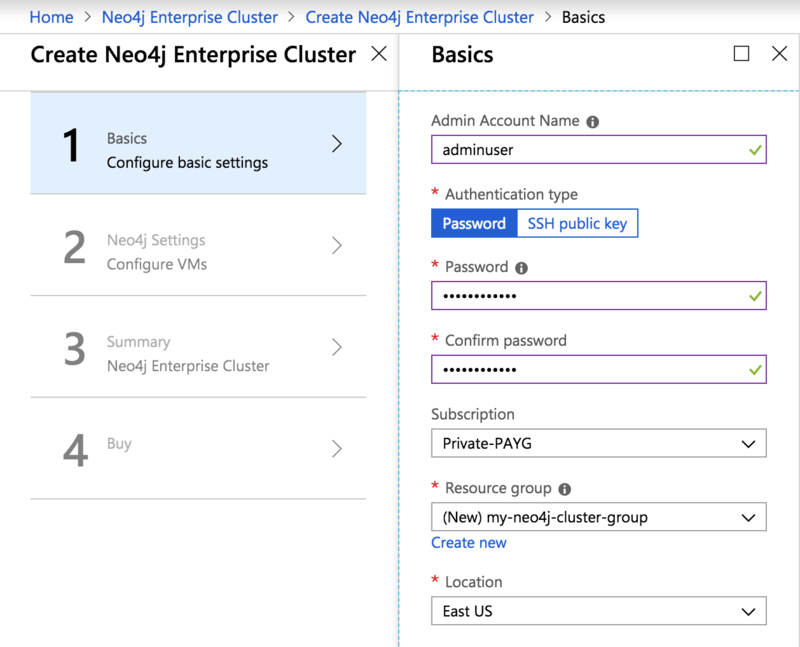 Knowledge of remote drivers to access Neo4j from your application helps you connect to your cloud-hosted database. 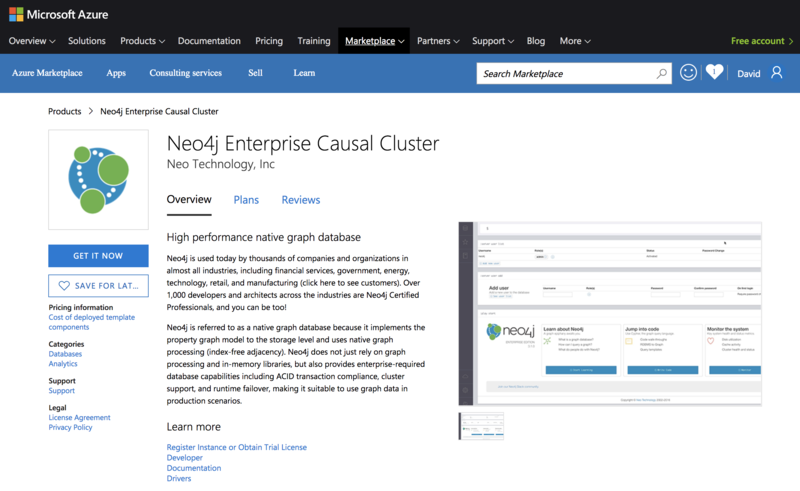 Navigate to the Azure Marketplace and search for Neo4j and make sure to select Neo4j Enterprise Causal Cluster. This link will take you directly to the right marketplace entry. Click “Get it Now”. A dialog will pop up providing basic details of the solution. Click “Continue”. The next screen provides a description of the solution and some screenshots. At the very bottom, the “Resource Manager” deployment approach will be pre-selected. Click “Create”. The first step is to configure some basics, shown below. The admin account name will be used for SSH access to the machines in your cluster. We recommend creating a new resource group to hold the artifacts of your deployment. Click “OK”. In the next section, you need to choose a password for the Neo4j user. You also select the number of core and read replica nodes in your cluster, along with the VM size, disk size/type, and IP allocation method. The cluster size (core and read replica nodes, along with VM size) is the largest cost driver of the cluster. You will be billed for Azure resource time only; as this is a “bring your own license” offering, you will not be billed hourly for the Neo4j software. Make sure to choose a meaningful name for the Neo4j Cluster Name. Most resources in the deployment will be named following this pattern. On the summary page, you will see a recap of all of your choices. At this stage Azure runs a validation process; the most common reason that validation might fail is if you choose VMs that are too large and exceed your Azure quota. These can be resolved by choosing smaller VMs or by increasing your VM quota. On the final screen you will be prompted to accept terms and conditions. At the bottom of the page, click “Create”. Your cluster deployment has now begun, and may typically take about 10 minutes to complete. You can monitor your deployment by checking the resource group you created and the “Deployments” menu underneath of that. After the deployment succeeds, we’re now ready to start using Neo4j! You may log in with user “neo4j” and the Neo4j password you chose in the configuration step. You may see an SSL warning screen, because the deployment out of the box uses an unsigned SSL certificate. To verify that the cluster has formed correctly, run the cypher statement CALL dbms.cluster.overview(). You may SSH into any of the machines using the admin credentials chosen in the first step of the deployment, and the IP or hostname chosen as part of the deployment process. Please consult Neo4j Cloud VMs for details on internals of Google VMs, including how to stop and start system services, configure Neo4j inside of the VM and more. 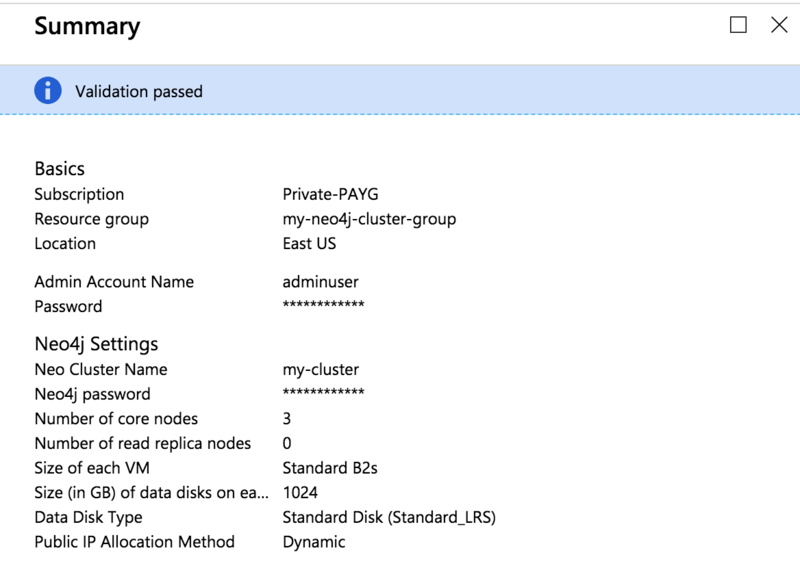 The following notes are provided on your default cluster configuration. Ports 7687 (bolt) and 7473 (HTTPS access) are the only ports exposed to the entire internet. Consider narrowing access to these ports to only your needed networks. External unencrypted HTTP access is disabled by default. Ports 5000, 6000, and 7000 are enabled only for internal network access (10.0.0.8), as they are needed for internal cluster communication. Consider creating DNS entries to permit addressing your cluster with client applications under a single host name. Should you need to, you can tear down the infrastructure created by simply deleting the entire resource group you created as part of the deployment.